This was an experiment that turned out wonderously. Having wanted to use miso paste for a while, I bought myself a little pack that then spent a couple of weeks staring at me from my fridge door. Until this recipe. Salmon and miso are very well known friends and I thought it would be a safe (and tasty) place to start my miso trials. I can confirm tastiness and safety have been achieved, alongside ease and overall deliciousness. 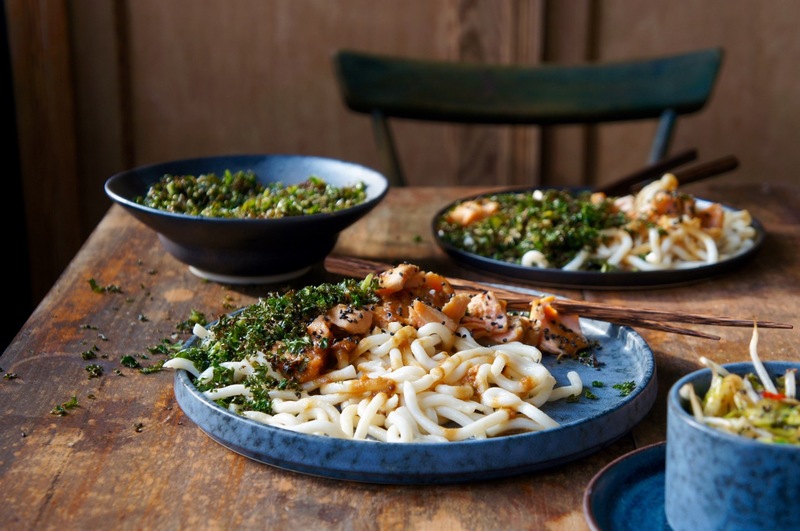 The udon noodles were added because they are giant chewy lengths of amazingness that are only bettered by being smothered in sauce. Crispy kale because making things crispy generally makes them better and kale is a top notch example of this. 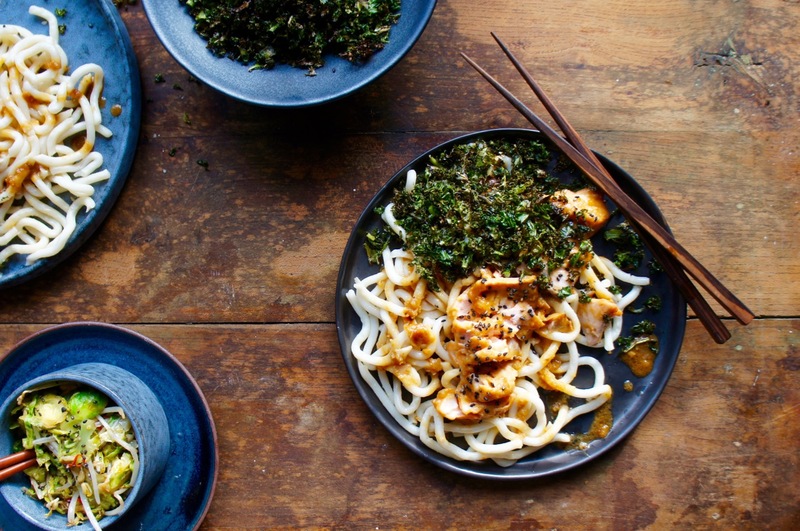 The crispiness really adds beautifully to the silky miso sauce and the texture of the udon noodles. All these ingredients are very easy to get in your local supermarket so no reason not to have a crack really. It happens to be healthy too, but don’t let that put you off. 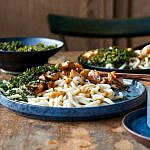 I serve mine with a side of stir fried veg, which I’ve included in the recipe below. If you don’t fancy making the veg, just leave it out. 1. MARINADE: Turn your oven on to 200 degrees C and boil a full kettle. 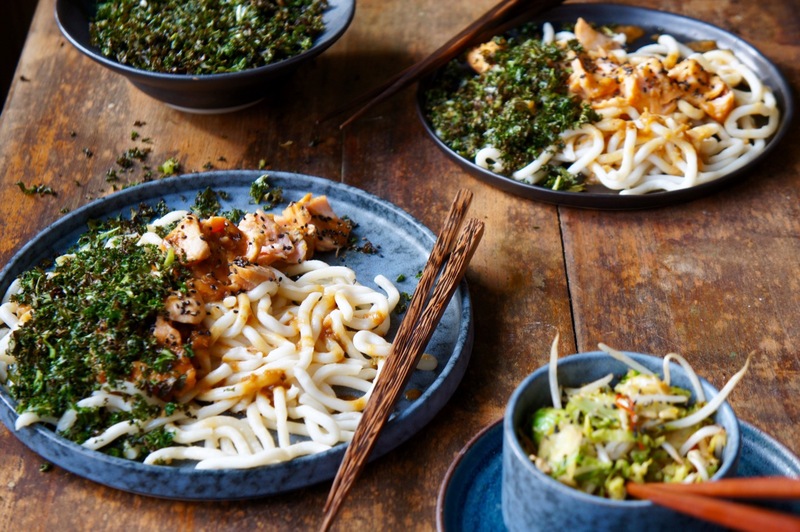 In a medium sized bowl, combine the miso paste, soy sauce, mirin, crushed garlic cloves and half the sesame oil (1/2 tbsp). 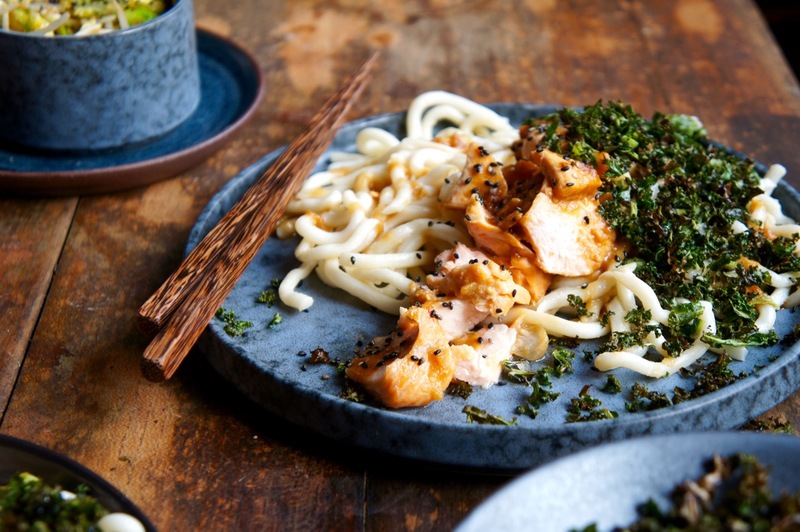 Add your salmon to the bowl and gently coat the salmon fillets in the miso marinade. 2. SALMON PARCEL: On a baking tray, make a sturdy foil parcel large enough for your 4 salmon fillets to nestle in. Curve up the edges to hold the marinade and leave enough foil to fold over the top to secure the parcels. 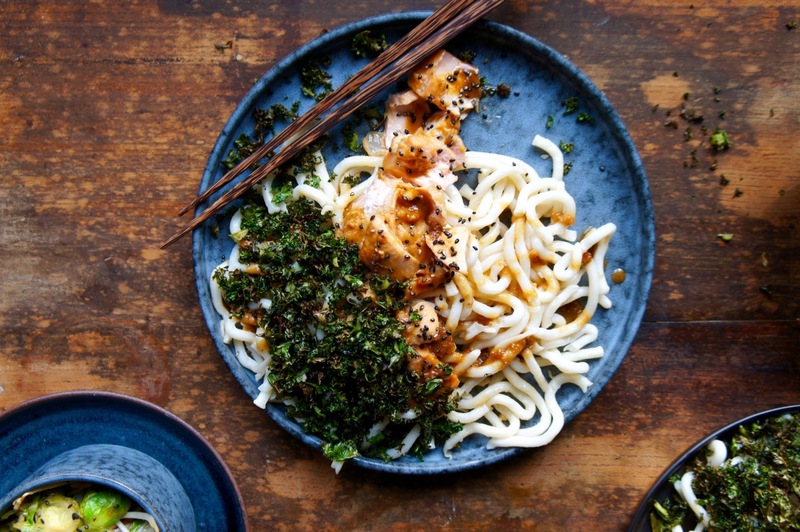 Place your salmon fillets in the middle of the parcel and pour over all the miso marinade. Close the foil parcel at the top and pop the baking tray in centre of the hot oven for 15 minutes. 3. 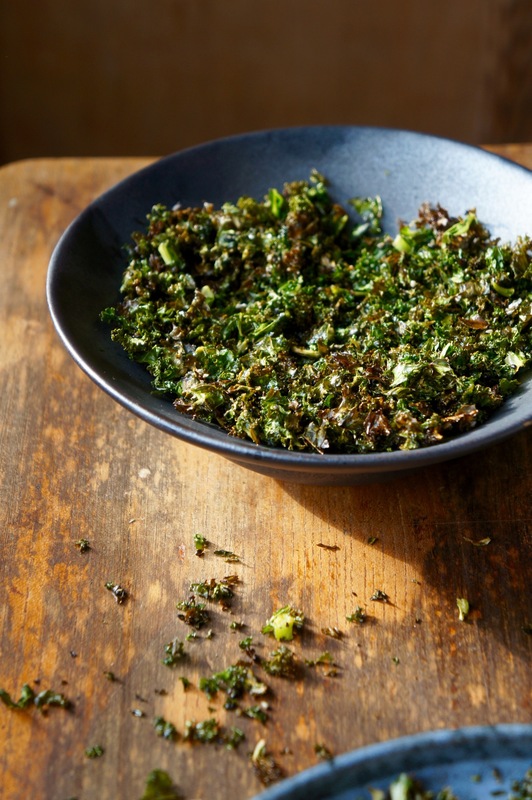 CRISPY KALE: Make sure the kale is completely dry and put it on a baking sheet. Drizzle with half a teaspoon olive oil, 1 teaspoon of sesame seeds and a generous pinch of salt. Scrunch the kale with your hands so the oil is distributed evenly. Put in the top of the hot oven with the salmon for 5 minutes or until crispy. Keep and eye out so it doesn’t burn, but it’s ok if some of the kale turns slightly brown. When ready, set aside to cool. 4. UDON NOODLES: Put your fresh udon noodles in a pan and pour over the boiling water. Leave for 30 seconds and then drain and rinse with cold water. 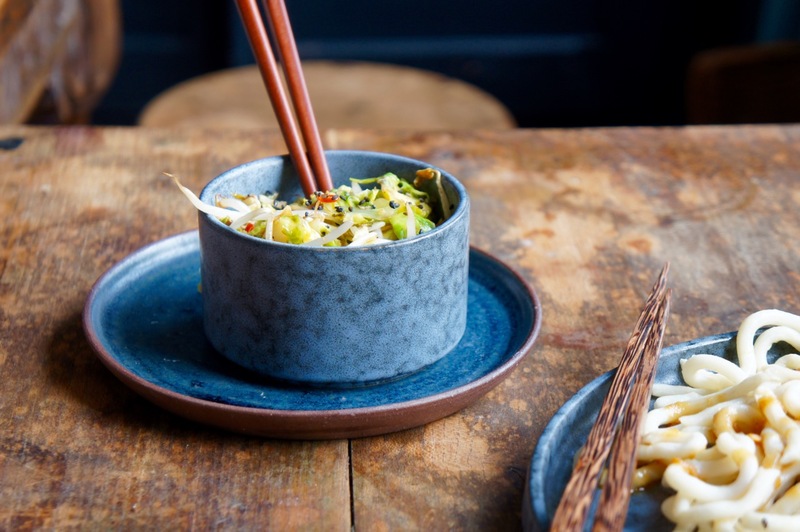 This separates and loosens the noodles, ready for your wok. If you’re using dried udon noodles, cook them according to packet instructions and drain, ready for the wok. 5. STIR FRIED VEG: Add your remaining 1/2 tbsp sesame oil to your wok and add the sliced shallot. Stir fry for a minute or so then add the mange tout. Continue to stir fry for a further 2 mins then add the shredded Brussels sprouts. Sprinkle over your bouillon powder/stock cube and continue to toss. Add a tiny splash of boiling water if necessary to help dissolve the stock powder. When your vegetables are starting to soften and char but are still crunchy, move them from the wok to a separate bowl until the salmon is ready. Toss your noodles in the hot wok to warm. Feel free to toss your noodles in with the veg! 6: SAUCINESS: When the salmon is ready (just cooked through), remove from the oven. Pour or spoon the miso marinade mixture from the foil onto the noodles, you want the noodles very saucy! Gently flake the salmon into medium / large chunks and remove the skin. 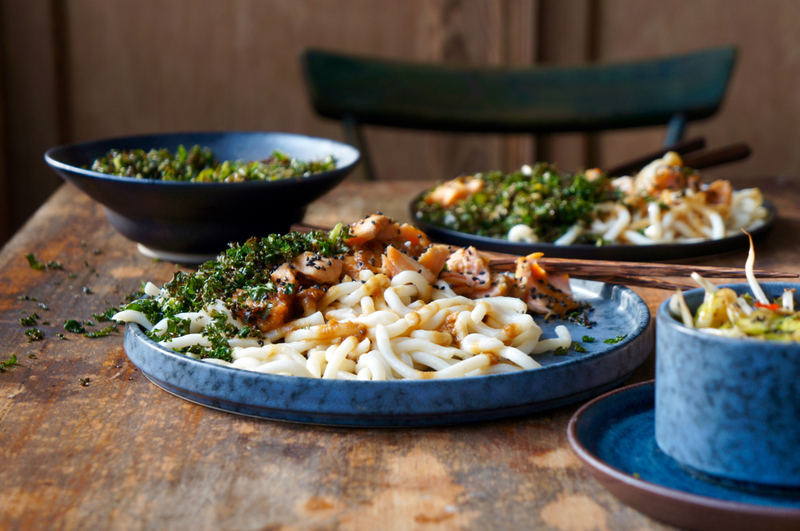 Top each noodle bowl with salmon chunks, a handful of crispy kale and a generous sprinkling of toasted sesame seeds. You can also mix everything together in the wok if you want the salmon more distributed. Zo lekker.